California Gov. Jerry Brown on Sept. 27 signed four new bills into law that will boost both behind-the-meter and utility energy storage capacity. Incorporated within one bill -- AB 2868 -- the state government directs California's investor-owned utilities (IOUs) to ramp up their acquisition of distributed energy storage capacity by exploring the feasibility of investing in an additional 500 MW. 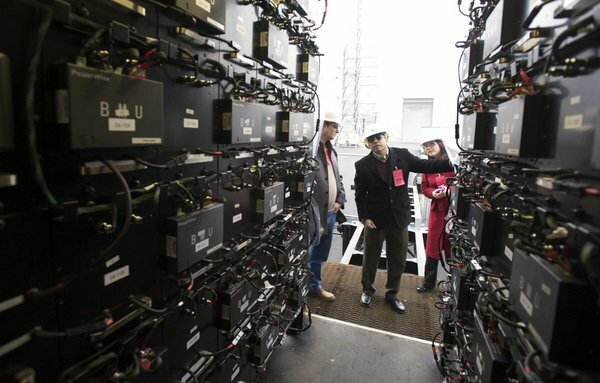 Energy storage is playing a growing role on California's power grids and behind utility meters. The massive leak at the Aliso Canyon underground natural gas storage facility and the resulting increased threat of power shortages has led regulators and utilities to advance their energy storage procurement schedules. Over the longer term, utilities and grid regulators need to be able to integrate ongoing growth of distributed renewable energy generation capacity in light of the higher, recently enacted a target of renewables meeting 50 percent of utilities' generation assets by 2030. Pacific Gas & Electric (PG&E), San Diego Gas & Electric (SDG&E) and Southern California Edison (SCE) are in the process of acquiring 1.325 GW of energy storage capacity by 2020 as mandated by California AB 2514, the first energy storage mandate to be enacted by a U.S. state. Enactment of the four new pieces of legislation raises the bar and adds momentum to it. "The passage of AB 1637 by Governor Brown makes way for increased adoption of climate-friendly energy storage projects while encouraging reliability and resilience of the electrical grid," Green Charge CEO Vic Shao told Renewable Energy World in response to an email inquiry. Enactment of the four pieces of legislation also elicited praise from the California Energy Storage Association (CESA). "California leads the world in the clean energy storage sector and the passage of this bill will translate into further opportunity for schools and businesses to benefit from storage solutions with no upfront costs," CESA said in a statement. AB 1637 (Low) -- Increases the Self Generation Incentive Program (SGIP) funding by $249 million, sending a clear market signal to industry stakeholders that behind-the-meter energy storage will play a key role in reducing greenhouse gas emissions and supporting the next-generation electric grid. Thanks to the California Public Utilities Commission's (CPUC) recent SGIP reforms, 75 percent of the program budget going forward is now reserved for energy storage. AB 2868 (Gatto) -- Requires the CPUC to direct California's three IOUs to accelerate the deployment of distributed energy storage by filing applications for new programs and investments of up to 500 MW. This bill directly increases the market for energy storage in California, as the 500 MW is in addition to the 1.325-GW procurement goal that California established in 2013. AB 2861 (Ting) -- Authorizes the CPUC to create an objective, expedited dispute-resolution process for distributed, behind-the-meter energy resources attempting to establish an interconnection to an IOU's electricity distribution network. This bill and resulting dispute resolution process will accelerate and reduce Rule 21 interconnection costs. AB 33 (Quirk) -- Directs the CPUC and California Energy Commission to evaluate and analyze the potential for all types of long duration bulk energy storage, such as pumped hydro, to help integrate renewable generation into the grid. This bill ensures broader consideration of bulk energy storage's unique capabilities and market roles. "Collectively, these bills will grow behind-the-meter and utility-scale energy storage markets, create new clean energy jobs, reduce distributed energy resource interconnection challenges, and ensure that bulk energy storage is part of California's renewable energy future," CESA said. It has become clear that energy storage is going to play an important role in California. "In different ways, all four of these bills facilitate adoption and use of energy storage," Alex Morris, CESA's director of policy and regulatory affairs, told Renewable Energy World. "They tackle different aspects of the challenge, but from a 'big picture' perspective, they're all about expanding the role energy storage plays, providing tools to integrate renewables and giving customers more ways to manage energy costs while ensuring grid reliability."